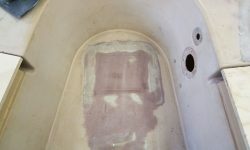 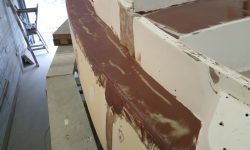 I continued to close in towards the effective end of the most significant deck repairs with another round of sanding. 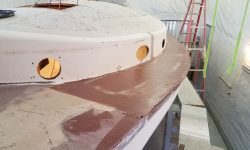 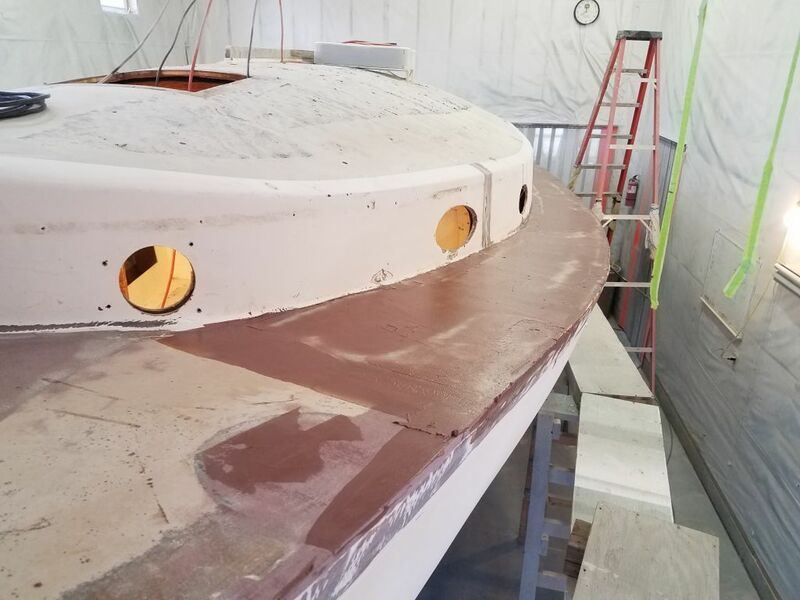 With many smaller cosmetic repairs still to go, as well as the work on the hull-deck joint, I looked forward to wrapping up this round of major work so I could focus on the rest. 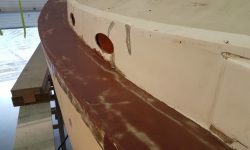 After the usual cleanup, I applied additional fairing filler where necessary. 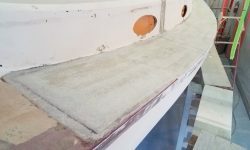 The bridgedeck and coachroof (and other, smaller areas) were all more or less at the proper contours, but there were sundry trowel marks and low spots that required attention. 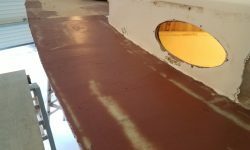 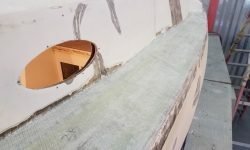 On the new port sidedeck, I applied an initial coat of fairing filler to fill the weave of the cloth and bring the deck to an approximation of its final shape. 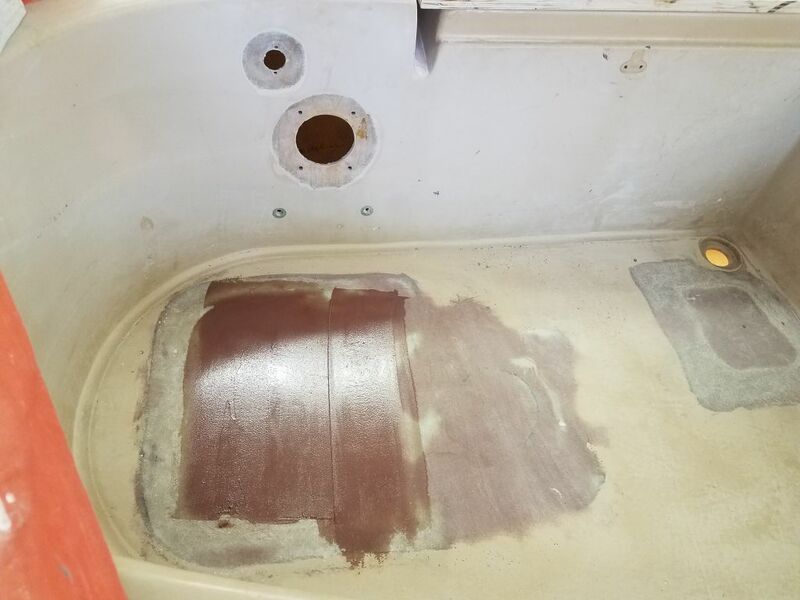 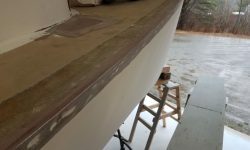 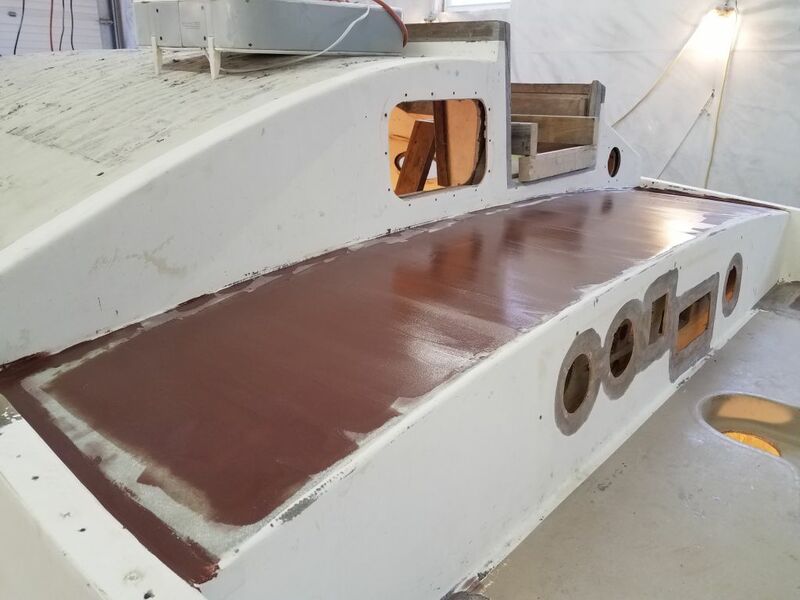 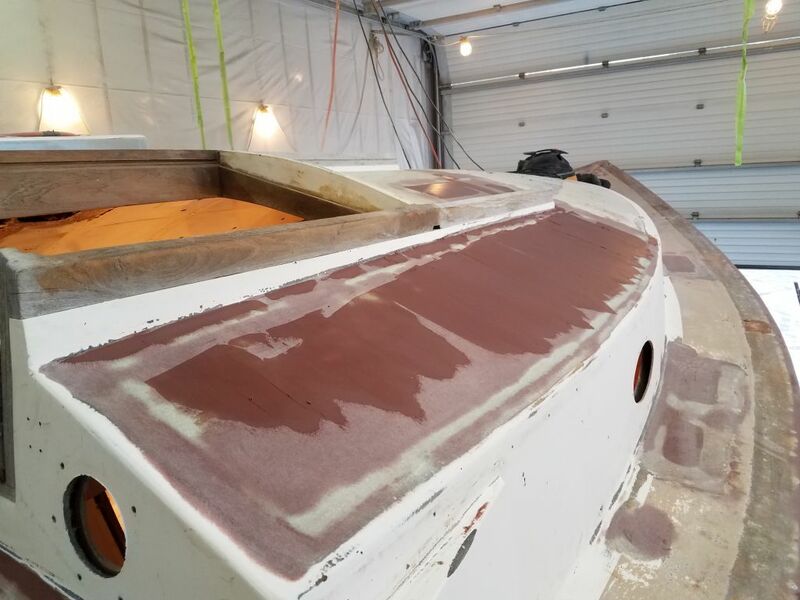 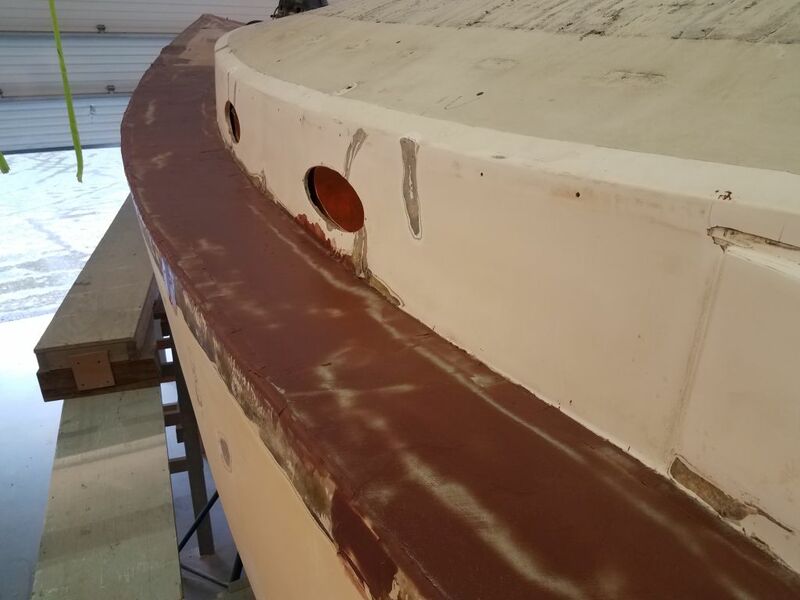 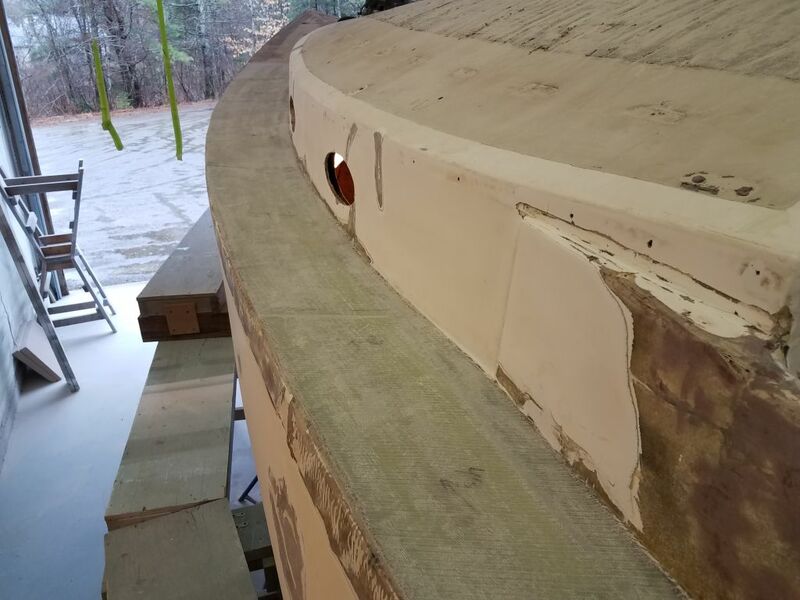 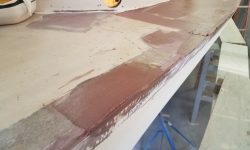 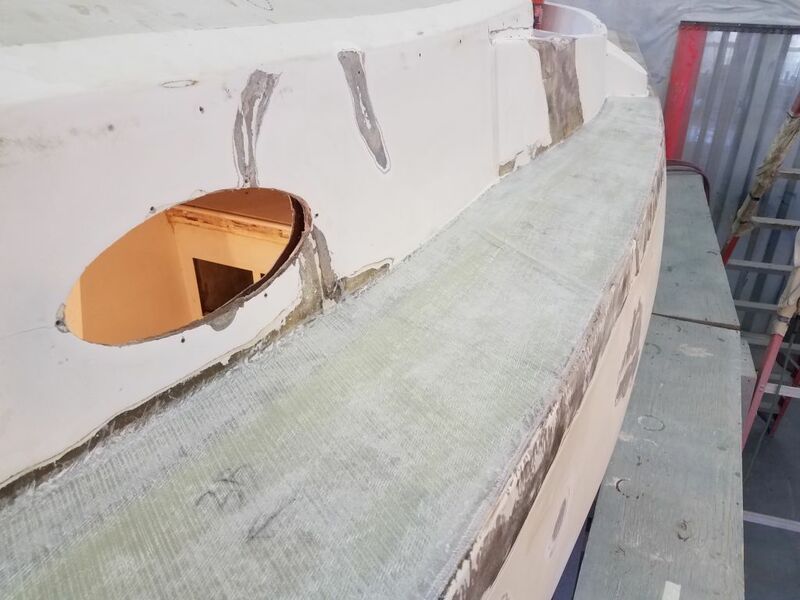 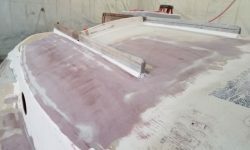 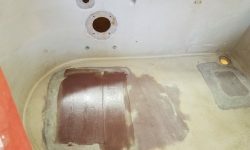 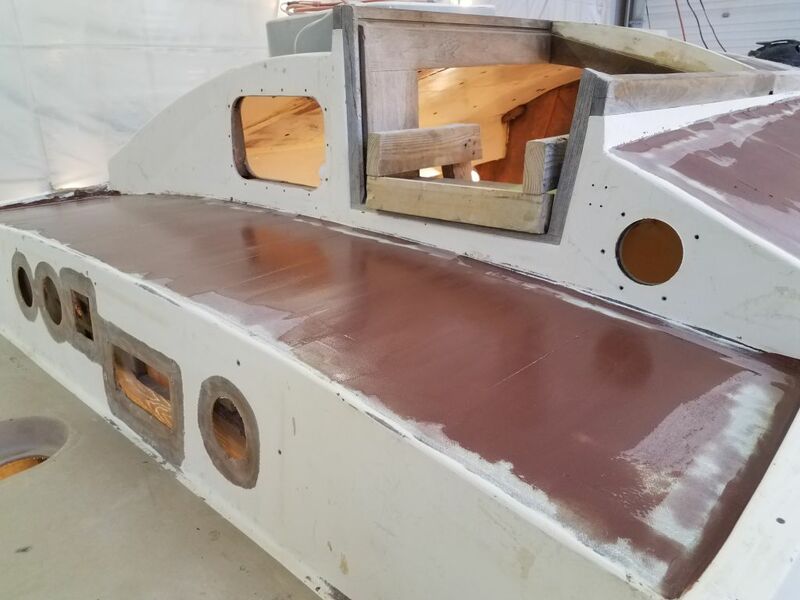 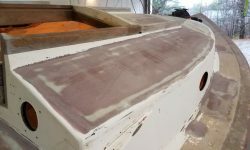 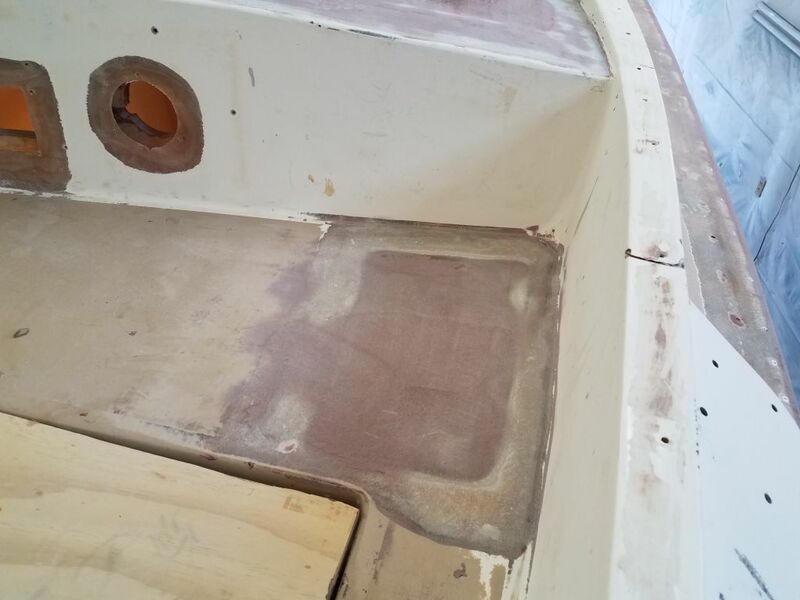 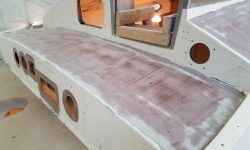 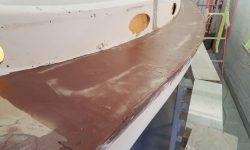 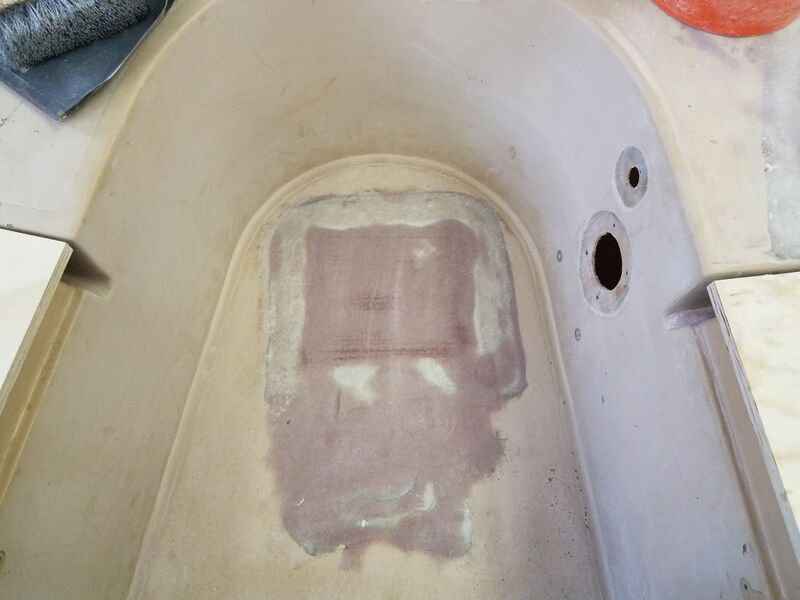 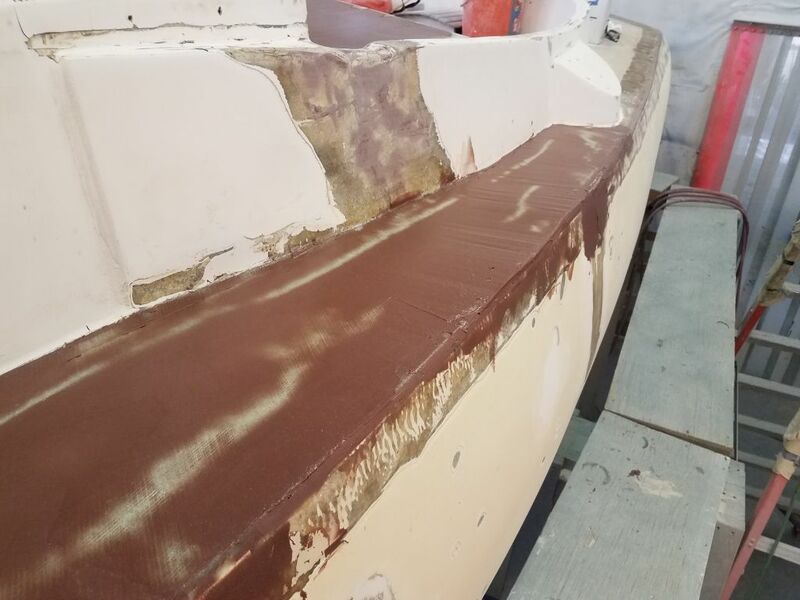 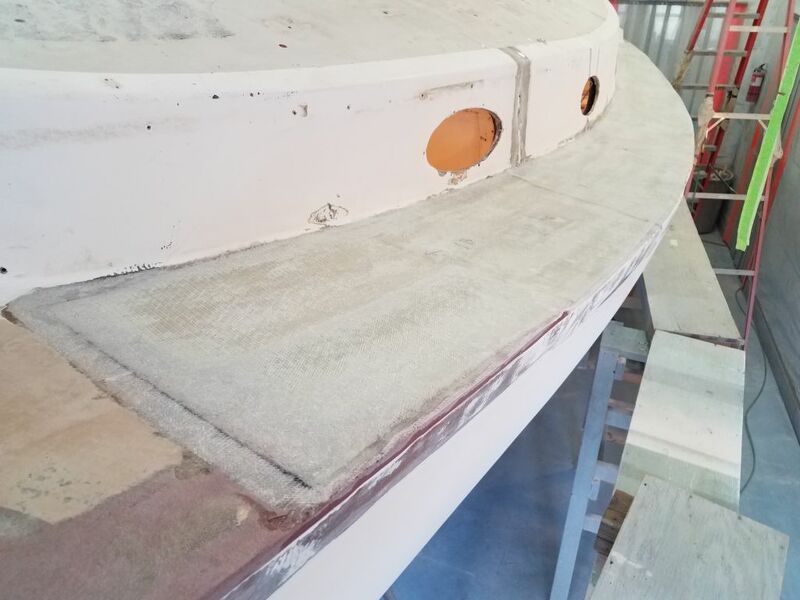 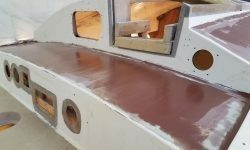 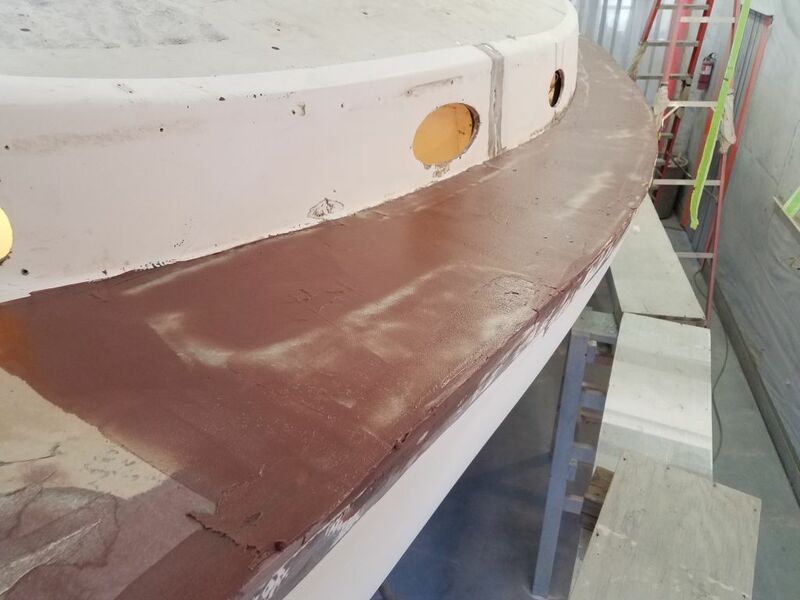 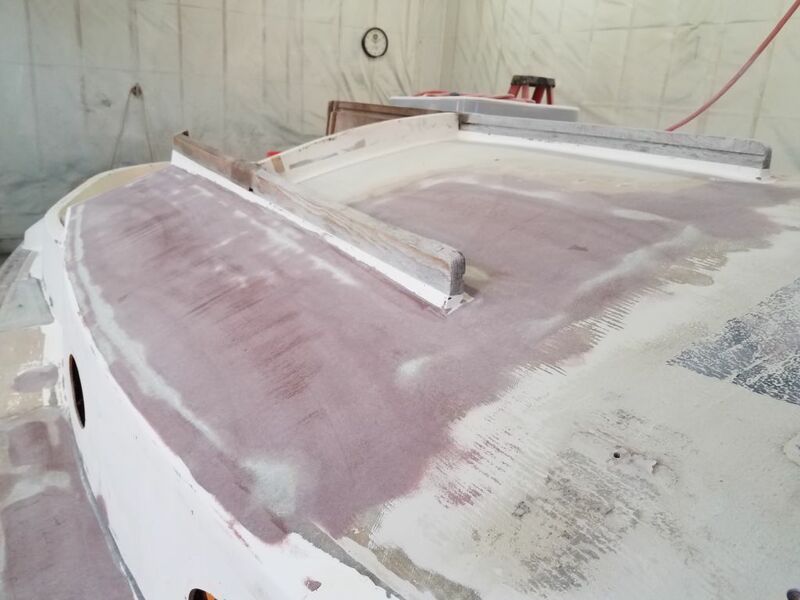 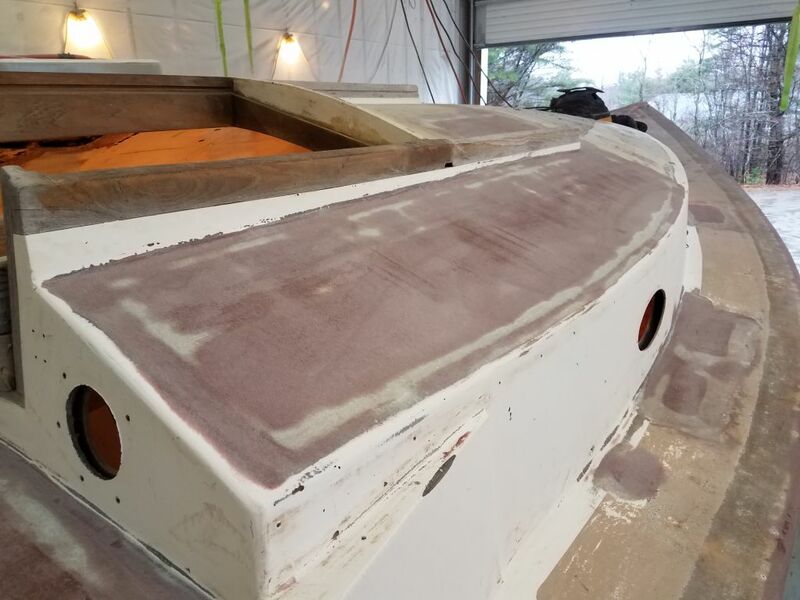 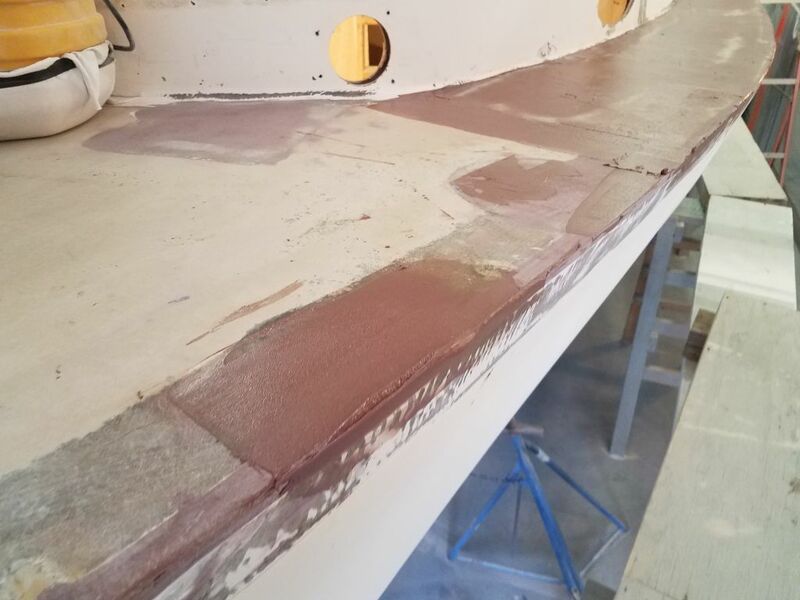 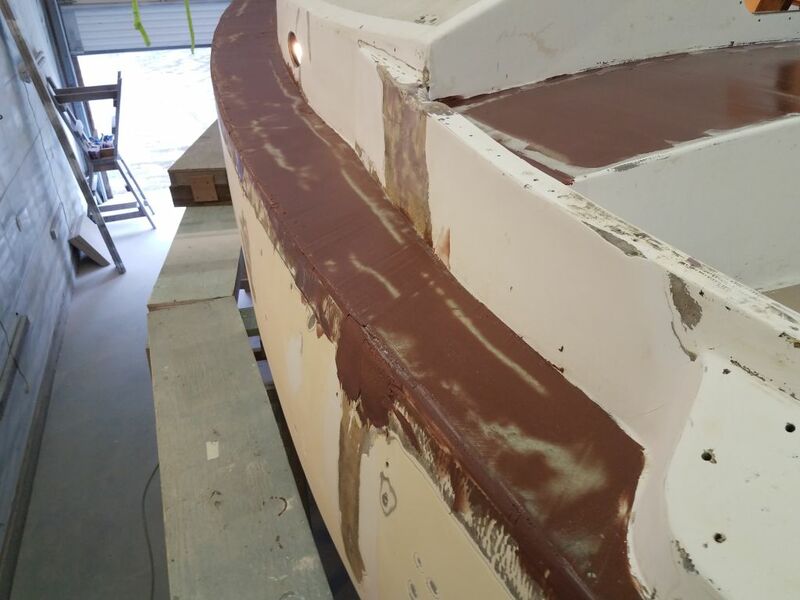 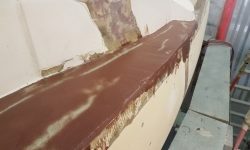 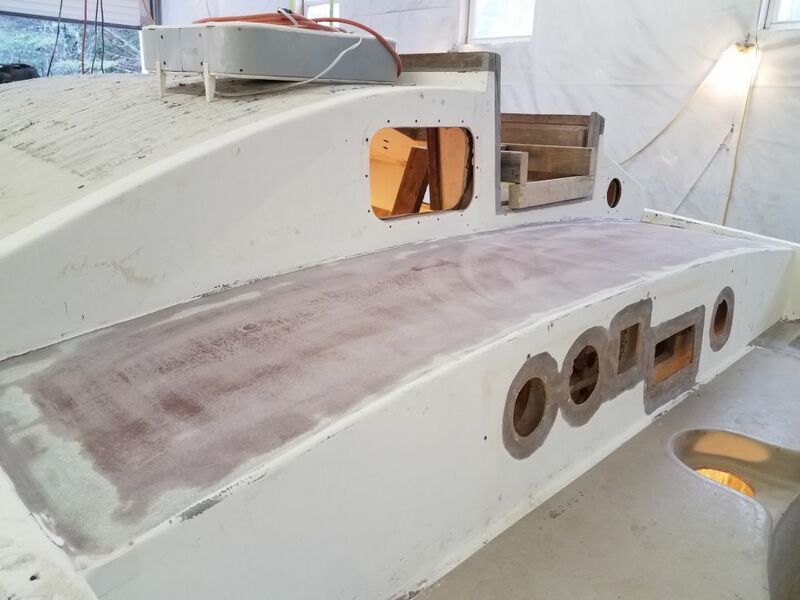 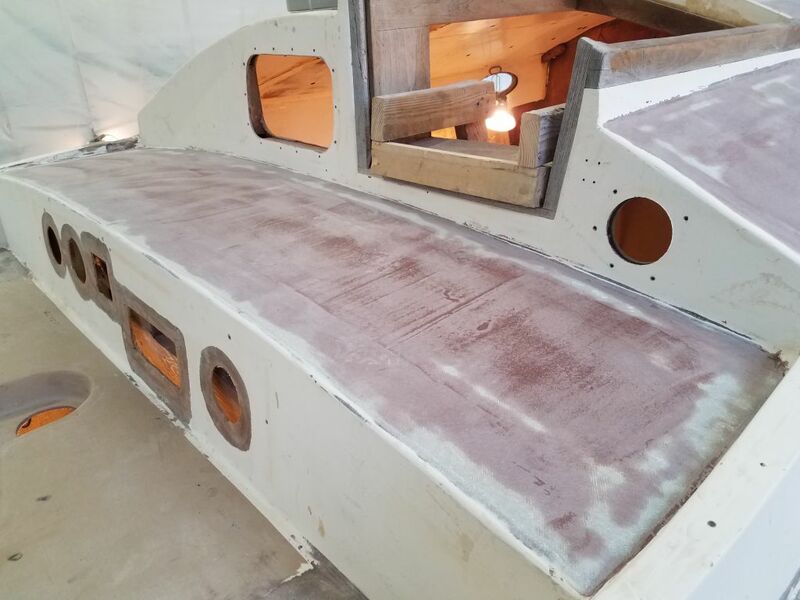 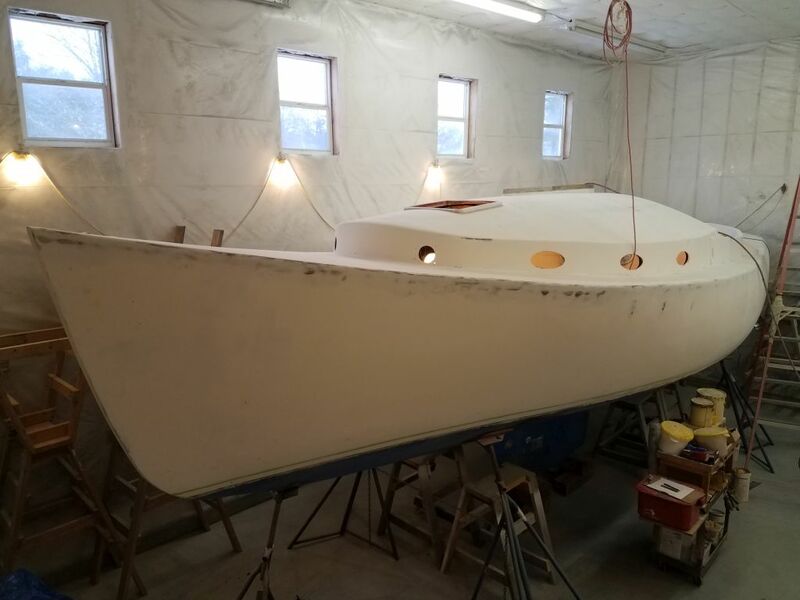 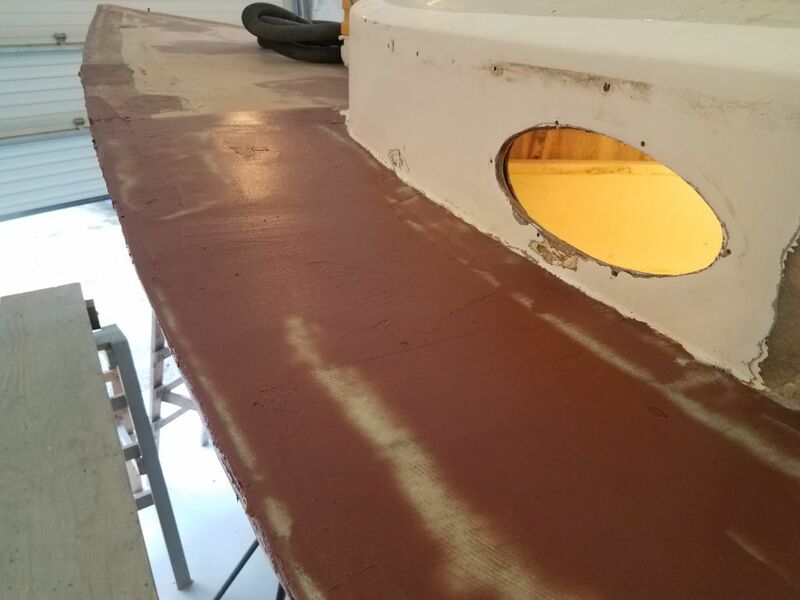 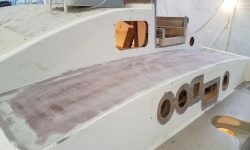 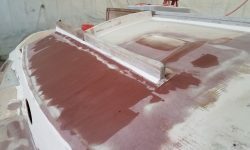 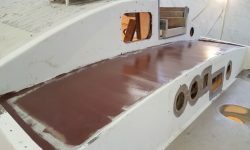 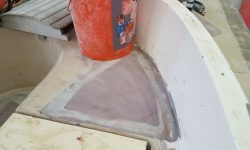 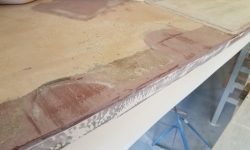 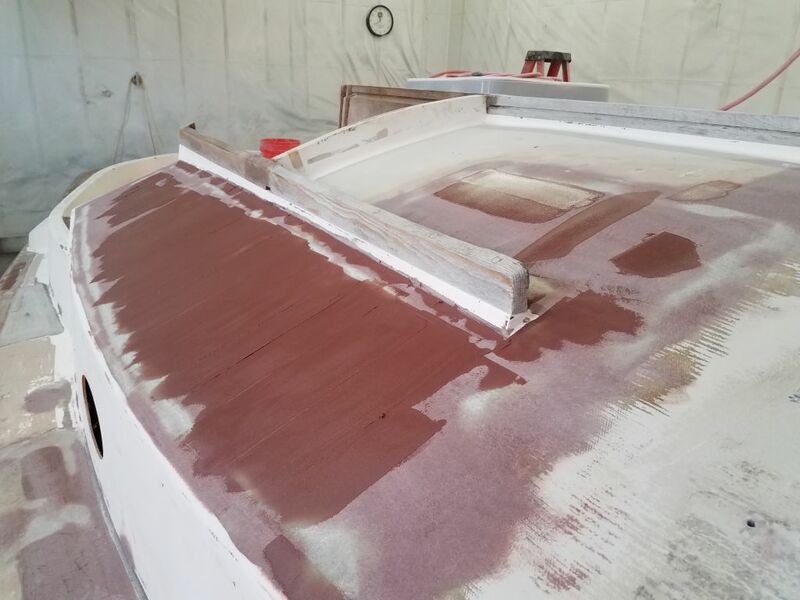 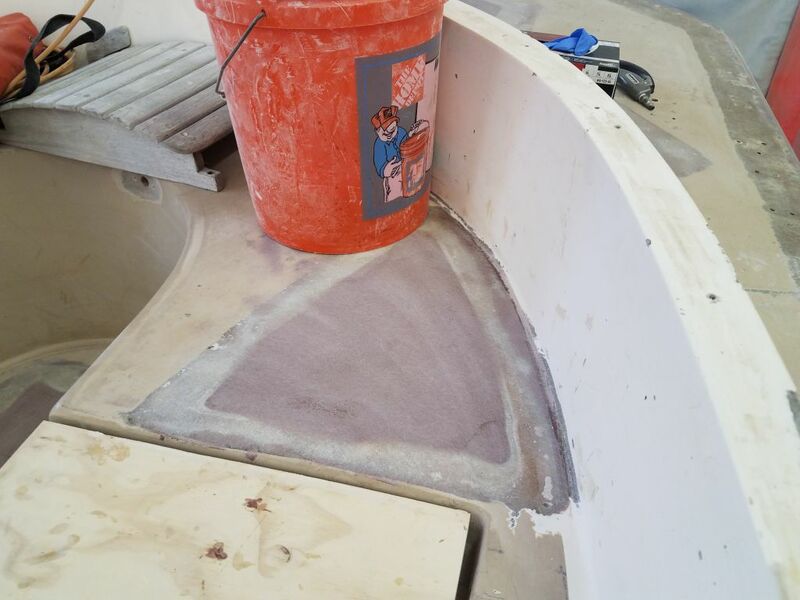 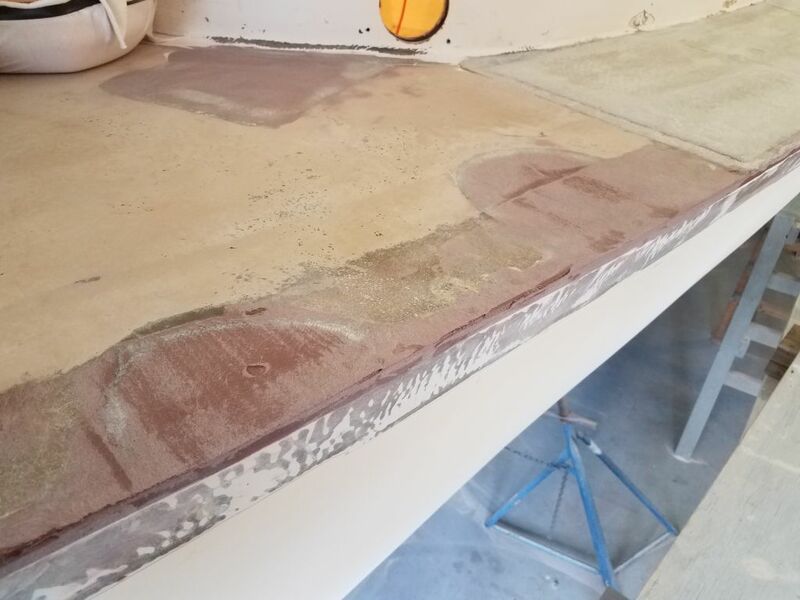 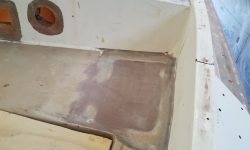 There was a sort of oddball transition at the forward end, where the “old repair” had met the existing foredeck, and where I’d cut out additional suspect material in order to make the new work better. 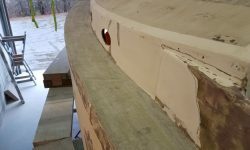 The need to start somewhere and build off the old work, particularly with the damaged and oddly-build inner skin on this side of the boat (and where it transitioned to the original construction in the area in question) required this transitional area, which had also been evident in the old work before demolition; the fact that it was evident was indicative of the overall effectiveness of that now-dismantled repair. 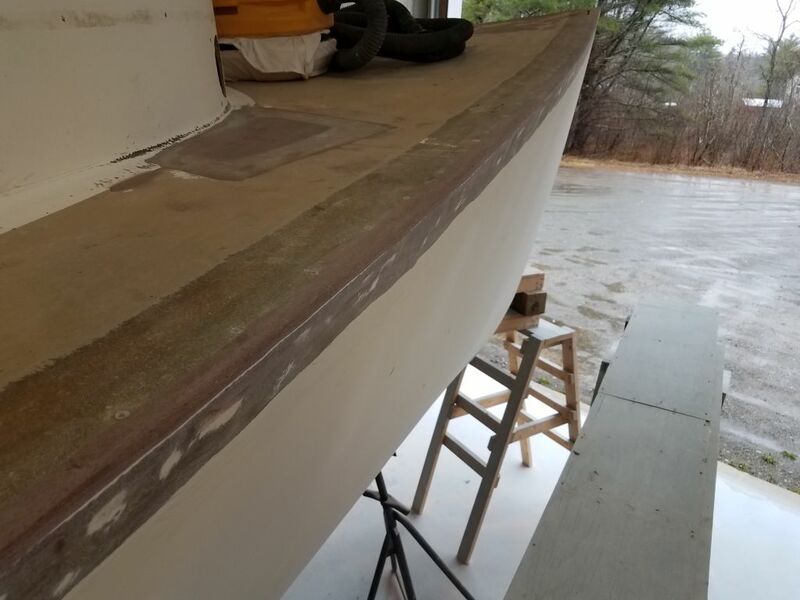 Now, though the little bump necessarily still existed, this section would fair in properly with the new after portion of the deck without much trouble. 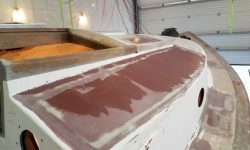 The first coat made good strides in this direction.